Our smartphones are both a utility and accessory. We need to carry them around each day, on all occasion and with all kinds of outfits that we carry. Understandably, it makes sense if you want to go with a branded option even if that means compromising on a few hardware specifications. Besides, going with a leading brand entails advantages like better, cheaper after sales support and other perks. For instance, Samsung users recently got to grab Reliance Jio SIM cards with unlimited 3 months data before everyone else. Point being, if you have already decided on buying a Samsung brand, here are the best available Samsung smartphones under different budgets that you can opt for. As of now, the Samsung Galaxy S7 and S7 Edge are the best that the Korean conglomerate has to offer. These premium devices not just mesmerize with their looks, they certainly have the hardware muscle to shun the competition. The primary highlight is the best low light camera performance available in the market today. Another premium feature which comes with these premium devices is their ability to resist water and dust. So if you are looking to buy the best Samsung phone that money can buy, you should consider buying either the Samsung Galaxy S7 or Galaxy S7 Edge (or patiently wait for the Note 7?). Samsung Galaxy Note 5 Dual SIM is almost a year old but still it is one of the finest phones available in the market today. On the outside, it looks similar to latest S series flagships but is only a bit taller. Performance wise there is hardly anything to complain about in this smartphone. It has a capable camera, fast chipset, good GPU for all the ‘2K’ heavy lifting and decent battery backup. Continuing with the Note series trend, Galaxy Note 5 also features an improved S-Pen which has some new tricks up its sleeves. 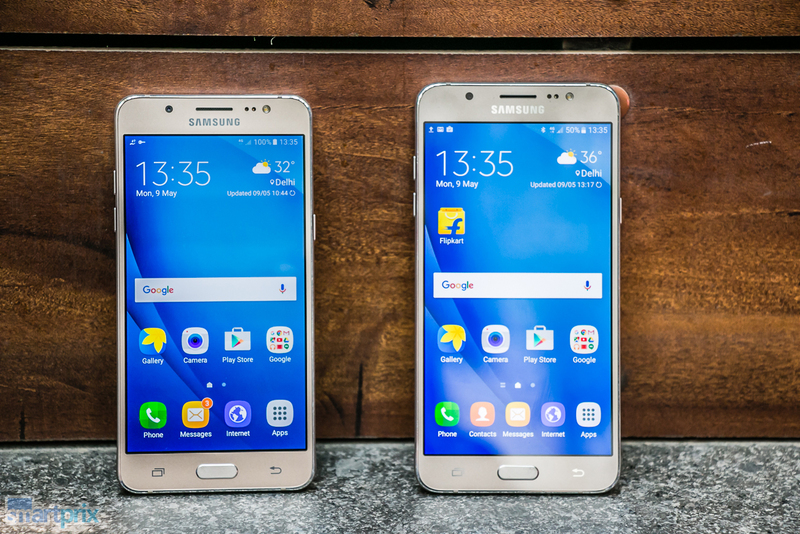 If you are in the market and looking to buy a premium smartphone which is less taxing on the pocket as compared to Galaxy S7 and Note 5 then Samsung Galaxy S6 Edge Plus could be your best bet. Taking a leaf out of Apple’s book, Samsung too decided to introduce a Plus variant of its 2015’s flagship device Galaxy S6 Edge. The USP of this phablet is its dual curved edges that also make it aesthetically appealing. The user can access notifications, quick contacts and watch time without turning the screen on using the side edge. Currently, it is retailing in India for around Rs. 40,000. If you are not ready to shell out more than Rs. 30,000 on a smartphone but you want to buy a phone which evokes a premium flagship feel, the new Samsung Galaxy A7 2016 is what you should go for. The metal chassis sandwiched between 2.5D Gorilla Glass 4 makes it tempting. Samsung’s Super AMOLED display further notches the bar up on the beauty quotient. That’s not all, it is powered by a capable octa-core Exynos 7580 chipset coupled with 3GB RAM. Samsung Galaxy A8 can easily tempt you with its sleek and super slim waistline. It is Samsung’s slimmest smartphone which flaunts a 5.7-inch Super AMOLED display. Despite featuring a metallic design it is slim and just 5.9mm thick. It features a 16-megapxiel primary shooter with a f/1.9 aperture lens that helps with decent low light photography. It is a more manageable member of Samsung’s A-Team. In terms of specification, there is nothing much to differentiate between Samsung Galaxy A5 (2016) and Samsung Galaxy A7 (2016). The only visible difference is in the size. The Galaxy A5 (2016) covers a smaller footprint thanks to its 5.2-inch Super AMOLED full HD display. Just like Galaxy A7 6 it has metal and glass built a home button embedded with a fingerprint sensor and TouchWiz operating system. Premium smartphone buyers are not the only one who are brand conscious. Budget smartphone users also prefer to side with branded options if they get a good value for money smartphone within their range. Targeting those buyers, Samsung launched its 2016 edition of popular Galaxy J7 6. In comparison with original 2016, Samsung Galaxy J7 6 offers slightly better hardware, metal finish, a more capacious battery and is running on Android Marshmallow out of the box. Samsung Galaxy J5 has been really popular among the masses and still continues to drive healthy sales for the company. To make the most of this popularity Samsung has refreshed it with Galaxy J5 2016 variant. Just like Galaxy J7 2016, it also gets a metallic side frame with a removable plastic back. Samsung has bumped up the RAM to 2GB from 1.5GB in the last iteration and has also increased camera megapixels count to 13MP. It comes with a 3100 large battery which can be replaced by users on their own. Under the 10K mark, Samsung Galaxy On5 Pro is perhaps the best Korean giant has to offer. This recently launched budget smartphone flaunts a 5.5-inch TFT display which as 1280 x 720 pixels resolution and 294ppi pixel density. What really set this apart from most under 10K phones is it one of those rare phones that come running on Android Marshmallow 6.0 based TouchWiz UI out of the box. Samsung has retained Ultra Data Saving Mode and S-Bike mode on the On5 pro. Samsung Galaxy J2 6 is the last phone that features in this list of best smartphone Samsung have to offer under different price range. This budget daily driver from Samsung features a unique Smart Glow notification light which encircles the rear camera module. Samsung Galaxy J2 2016 is the cheapest smartphone which features a Super AMOLED display and runs on Android Marshmallow. The phone also supports 4G LTE and Samsung’s new proprietary Turbo Speed Technology to boost things up. its one of the best samsung smartphones one can buy…i like this post very much. You provide a detailed information about the Samsung smartphone to buy. It’s very useful information.